The currrent Town Attorney is Matthew T. Gould, Esq. - Bell, Gould & Scott, P.C. Nunn Town Attorney Barbara Brittany Scantland informed the town board tonight that she would be stepping down from her position. Citing the political turmoil in the town in recent months, she said the time was right to end the relationship between the town and her Denver law firm, Murray Dahl Kuechenmeister & Renaud LLP. Scantland didn't mention the bloated legal bills presented to the town for the last few months or her unsuccessful legal maneuvers to help former board members Pigue, Alexander, and Smith avoid being recalled. For a blow-by-blow account of her efforts in Weld County District Court, read the transcript. The Board of Trustees acted immediately to advertise for proposals to replace Scantland and her firm. 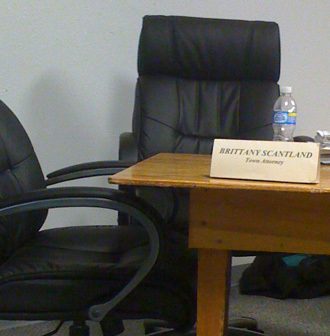 Scantland agreed to stay on until a new town attorney is appointed. Legal Services Agreement between the Town of Nunn and Murray Dahl Kuechenmeister & Renaud LLP, signed by former Mayor Duane Bayne on April 24, 2007 (PDF 279 KB, 6 pages including Schedule of Costs) Brittany Scantland, who received her law degree in 2004, is Nunn's appointed town attorney. Ms. Scantland's firm recently billed the town over $10,000 for legal fees incurred in September and October. The town's 2009 budget for legal services is $19,500. This legal services agreement can be terminated by the town at any time.